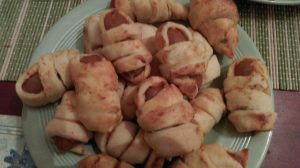 Sausage Mummies! – Create, Make & Bake! Time to start with the Halloween stuff, this is going to go on for a lot of October and most will be easy enough for smaller kids. These sausage mummies are one of my favourites because they are cute more than anything. 1. With your finger-tips, crumble together the flour, butter and salt until it resembles yellow-y breadcrumbs. Add the water 1 tbsp at a time mixing well with each addition until it comes together in a firm dough, add more water if necessary. If you want to you can refrigerate it. 2. Roll it out on a floured surface until about 2cm thick, cut into long strips. 3. This bit’s a bit tricky and messy, either a) dip the sausage into the mustard, THEN rapping to pastry round, or, b) cover one side of the pastry in mustard and wrap the sausage up. I recommend trying both of these to find the best way. 4. Bake at gas mark 4-5/180-190*C/350-375*F until pastry is golden brown (I didn’t keep track of the time so I just kept an eye on it). There you go!